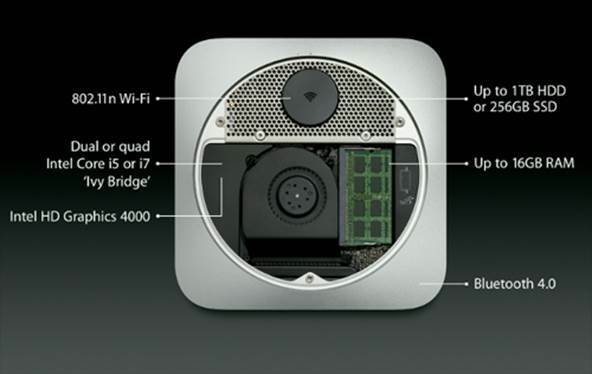 The Mac Mini is the first Mac in which Apple has delivered its new Fusion Drive. It’s also available to order in the new iMacs, which started shipping as we closed this issue. The new drive aims to offer the best of both the previously available options: mechanical hard drives, which these days provide enormous capacities at very low costs per gigabyte, and solid state drives (SSDs), which use expensive flash memory to offer vastly increased performance but can’t match the capacity in an iMac, but only the 1GB option is available in a Mac mini, adding $300 to the $1020 price of the eligible model. In both cases there’s 128GB of flash storage, the rest being provided by the hard drive. AnandTech (anandtech.com) reports that the total usable space is the consolidated capacities of both parts, minus 4GB of the flash storage. Essentially, whenever you try to write anything to the Fusion Drive, it’ll try to add it to the flash memory. Of course, that 128GB will fill up, so if the data won’t fit in the available space, it’s written to the hard disk instead. One reason why this is an effective scheme is that the data that gets written to a system’s drive first will tend to be the most commonly used. OS X itself is installed apps: Mail, Safari, iTunes and so on, the iLife apps and utilities. Of course, OS X won’t be the only code you use every day, and you may not even bother with some of its associated components. So as you use your Mac over time, the system continually looks at what you’re using most and keeps it on the flash storage, shifting less-often accessed apps and files to the hard disk, which in turn makes room for more on the faster flash memory. You could, of souse, just install an SSD and a hard drive as two separate volumes, as is an option on existing iMacs and MacBook Pros. But you’d then have to make your own decisions about what to keep on which drive. Should you install Adobe Creative Suite on the SSD but keep your documents on the hard drive, or vice versa? Or maybe use symbolic links (similar but not identical to aliases) to redirect the operating system and applications to a specific physical disk? It could get complicated, and it would be hard to know whether you were making the best decisions. By automating the optimization, the Fusion Drive turns familiar hardware into something much more useful – a similar sort of convenience aid to Time Machine, which makes backing up invisible, but with even less hassle, since Fusion Drive is preconfigured to deliver the speed boost without you ever thinking about it. Apple reckons it offers close to the performance of pure flash storage, but at the time of writing it hasn’t provided us with a Fusion Drive to enable us to test this claim. We’ll do so for our next issue. Should you install Adobe Creative Suite on the SSD but keep your documents on the hard drive, or vice versa? Or maybe use symbolic links to redirect the operating system and applications to a specific physical disk? Ars Technica (arstechnica.com) has published test results that showed a Fusion Drive reaching speeds in excess of 300MB per second, even reading and writing data to and from random areas of the flash storage. This bodes well. If you’re not planning to buy a new Mac at the moment, or are sceptical about paying $300 for 128GB of SSD space (about $90 retail), you might wonder about the possibility of creating a DIY Fusion Drive by adding software to a system with a standard drive and an SSD fitted. There’s no user-facing feature in OS X’s Disk Utility to allow an SSD and hard drive in any previous Mac to be reconfigured as a Fusion Drive. 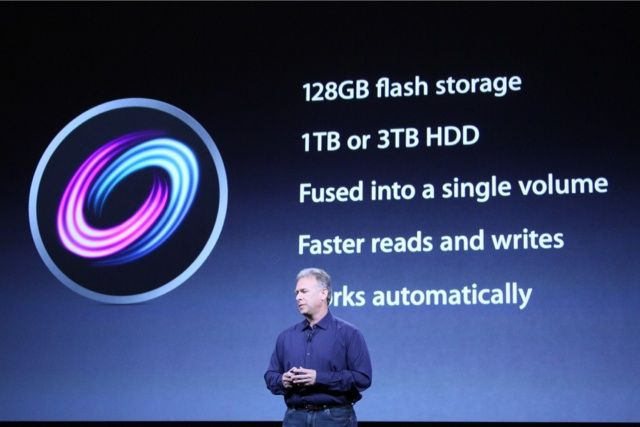 However, developer Patrick Stein has demonstrated (bit.ly/XOJgJf) that the features the Fusion Drive is built on – part of OS X’s Core Storage frame-work – are present in the regular version of Mountain Lion and make it theoretically feasible to set up a Fusion Drive yourself. This means using the command line equivalent of Disk Utility, and Stein draws attention to an increased risk of data loss in melding two volumes. Even if you were willing to attempt this, you’d want a cast-iron backup system in place. MacUser contributor Julian Prokaza followed Stein’s instructions to set up his own Fusion Drive in a MacBook Pro, but at the time of writing was still unsure about the results. ‘It’s working pretty well so far, and the MacBook is considerably faster at booting, app launching and so on,’ he told us. However, it was proving difficult to verify whether the key feature of Fusion Drive – the auto-matic promotion and demotion of items between the fast and slow drives according to how regularly they’re used – was working as intended, or indeed at all. We’ll let you know if and when his experiment produces more concrete data. Apple warns n an online support article (support.apple.com/kb/HT5446) that there are a couple of wrinkles to the Fusion Drive. If you choose the iMac’s 3TB Fusion Drive option, which certainly offers the most impressive setup, you won’t be able to install Windows on it, should you want to, buy the standard methiod using Apple’s Boot Camp Assistant, even though this is possible on the 1TB Fusion Drive. Apple hasn’t clarified why this is the case or when it might be remedied. If you do split a Fusion Drive’s single logical volume to install Windows (or another version of OS X), only the hard drive part gets partitioned. The original partition on the hard disk retains the Fusion Drive’s speed benefits, but the operating system in the second partition is excluded, acting simply as an ordinary hard disk – except the Disk Utility won’t let you create a third partition on it. Apple also recommends that you check with the soft-ware publisher of any disk utilities you use to verify that they’re compatible with your Fusion Drive. That’s only natural and in fact a good precaution whenever you update OS X, even between minor versions. Perhaps least reassuringly, although a dedicated version of Disk Utility is supplied with Fusion Drive Macs, Apple warns that if it finds the drive needs to be ‘repaired’ - often a minor issue with plain hard drive - this will erase all the data on your Fusion Drive. Time Machine, evidently, is a must.